Years ago when I heard someone mention how delicious the fish tacos were they had eaten at a restaurant downtown, I thought it was the most appalling thing I’d heard in a long while. I realized I had the form of a traditional taco stuck in my head, with fish. No one would like that. 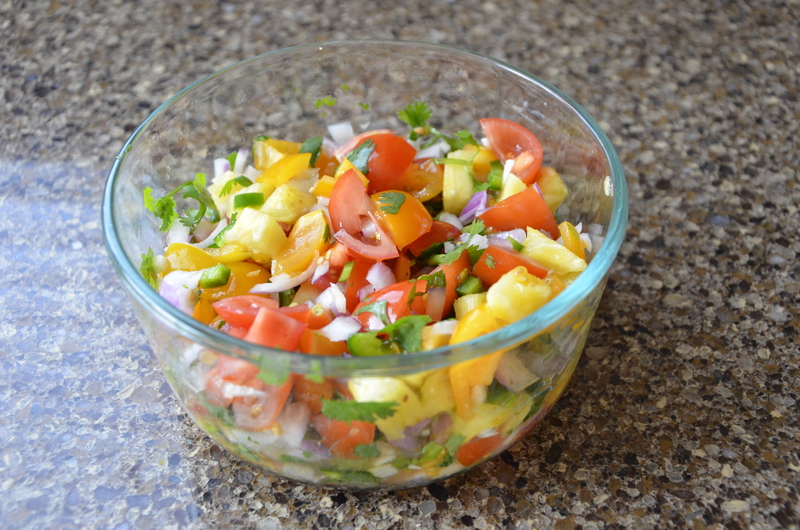 Fresh Pico with cherry tomatoes, red onion, pineapple, cilantro, garlic, jalapeno, and fresh squeezed lime juice. Finally, I was talked into trying them and there was no turning back. 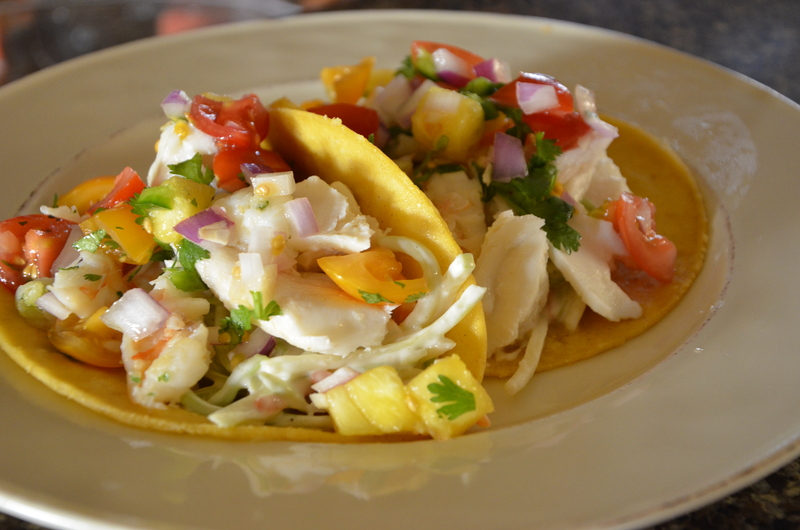 Fish tacos when made correctly, are bright and light and absolutely full of fresh flavors. Creamy broccoli slaw with olive oil mayo, apple cider vinegar, freshly ground pepper, and a generous pinch of coconut sugar crystals. 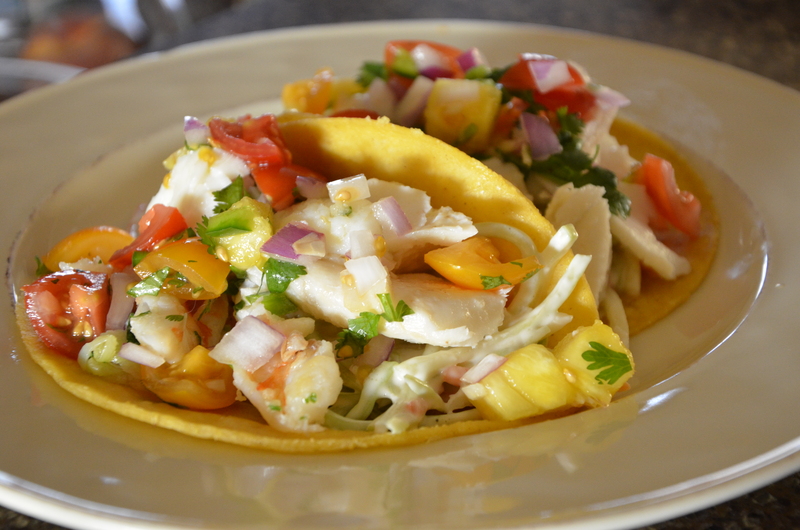 There’s texture and flavor contrasts, which are an absolute must in a fabulous fish and shrimp taco. A lightly fried corn tortilla brings all of the flavors and textures together. Just a couple of seconds in avocado oil is all it takes. If you’ve never fried corn tortillas, you’re missing out on fabulous comfort food. They are fried quickly, just a couple of seconds on each side in very hot oil. This leaves them soft and supple and they have such an amazing aroma and flavor. I make traditional tacos like this as well. 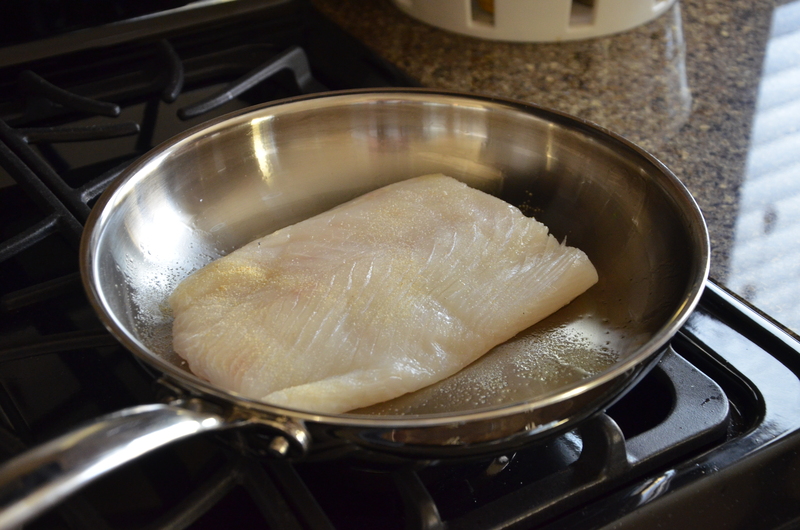 The halibut is steamed so it turns out flaky and gorgeous. Oil pan with olive oil and top halibut with garlic powder & sea salt. Once it was finished steaming, I gave it a good squeeze of fresh lemon. 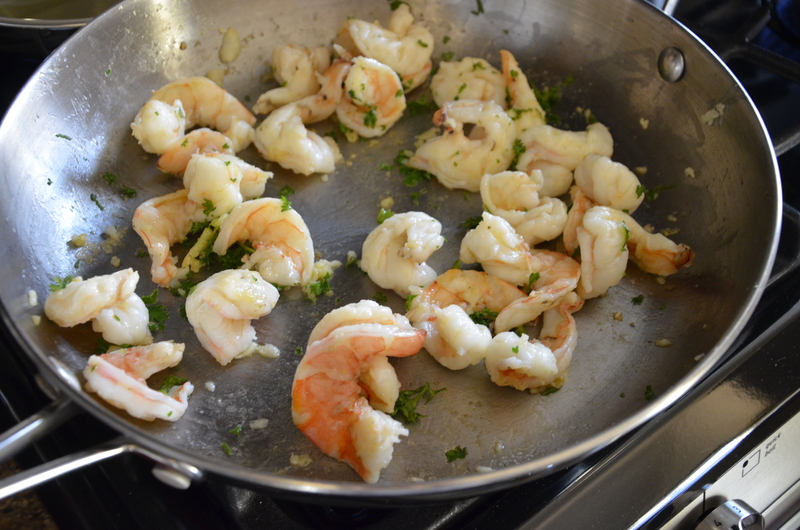 The shrimp is sautéed quickly in olive oil and pressed garlic, and finished with fresh parsley. These were HUGE shrimp. I cleaned them and sliced them down the middle. Once they were done, I sliced them again in half. It may look labor intensive, but the entire meal comes together very quickly. Make the broccoli slaw and pico first. 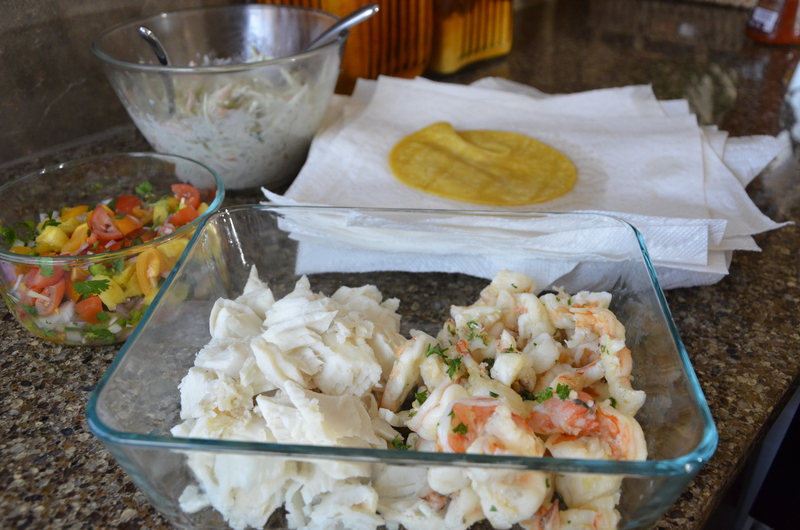 Then while the shrimp is sauteing and the halibut is steaming, fry your tortillas. Keep a close eye on your shrimp though, it cooks very quickly and you don’t want it being over done. It will cook faster than the halibut. When it was just at the done point I quickly removed it from the heat and set it on the back burner while the halibut finished and the tortillas fried. You can make it as casual or as fancy as you’d like. We went casual. Served it right off the kitchen counter and we ate while watching a movie. This is a great summer meal for company as well. 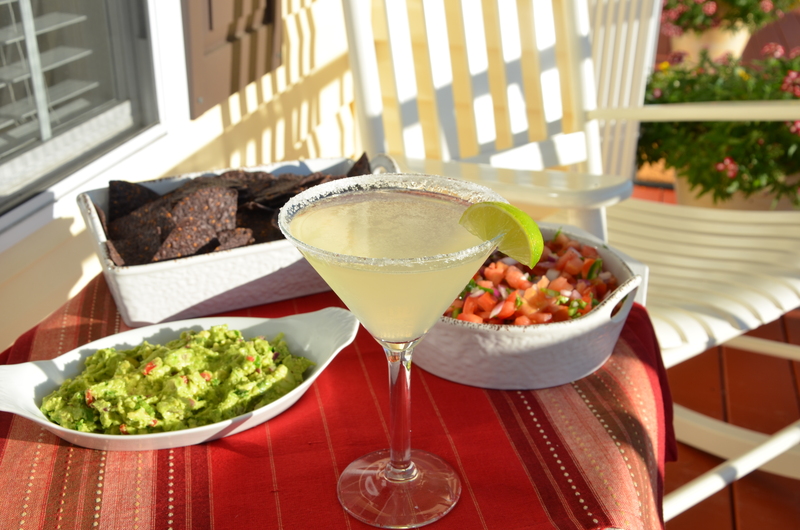 Larger quantities of course, but you could make a taco bar on the deck or patio and enjoy an outdoor meal. A Lemon Lime Margarita would be the perfect touch. Whisk the mayo, vinegar, and sugar together. 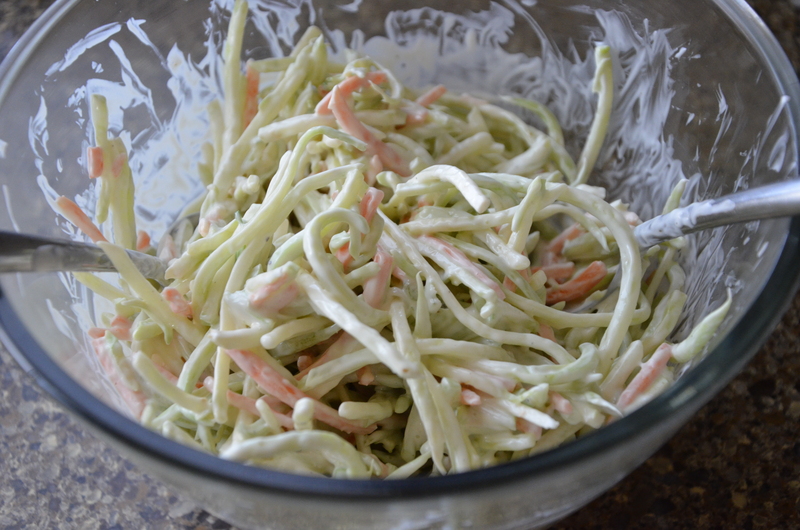 Pour over slaw and add ground pepper. Toss well to coat. Refrigerate. 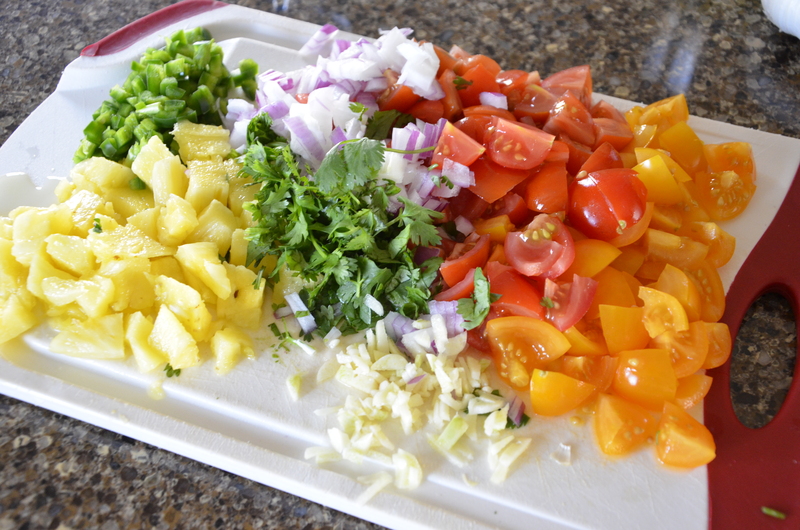 Add all ingredients to a bowl and toss. Refrigerate. Fill the saute pan 1/4 to 1/2 way with the oil. Heat on medium high. 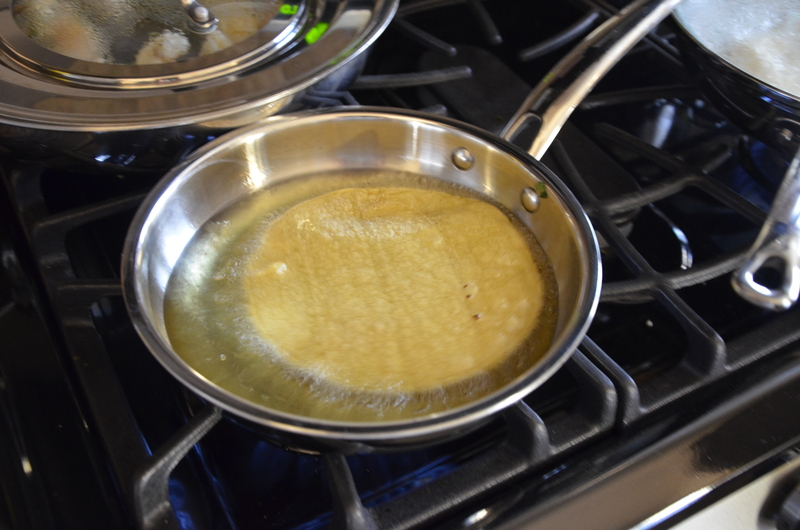 When oil is hot, carefully dip the tortilla in the oil and fry for about 2 seconds. Quickly flip the tortilla with the tongs and fry for another 2 seconds. 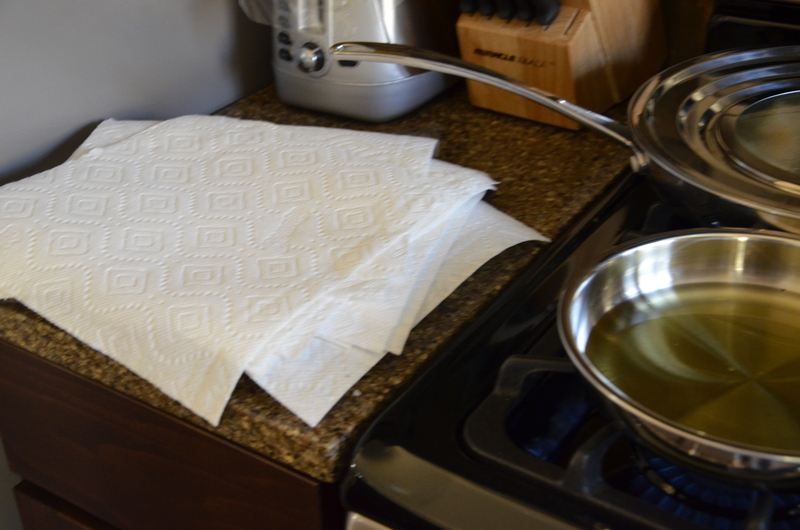 Remove tortilla to paper towel and cover with another paper towel. Repeat until all tortillas are cooked. It’s important to make sure the oil is hot. 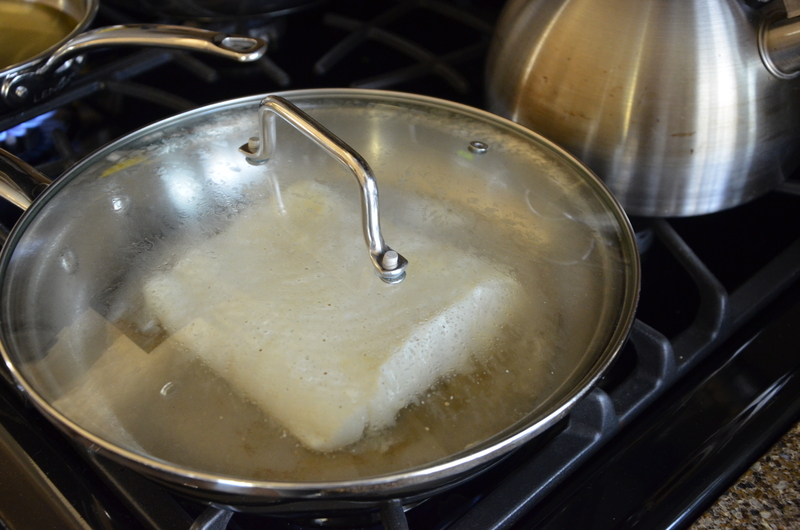 The tortillas should start frying immediately when they touch the oil. Allow the oil to cool completely and then dispose. I pour mine in the garbage can…not a good idea to pour it down the sink. Oil two medium-large skillets with olive oil and heat to medium. 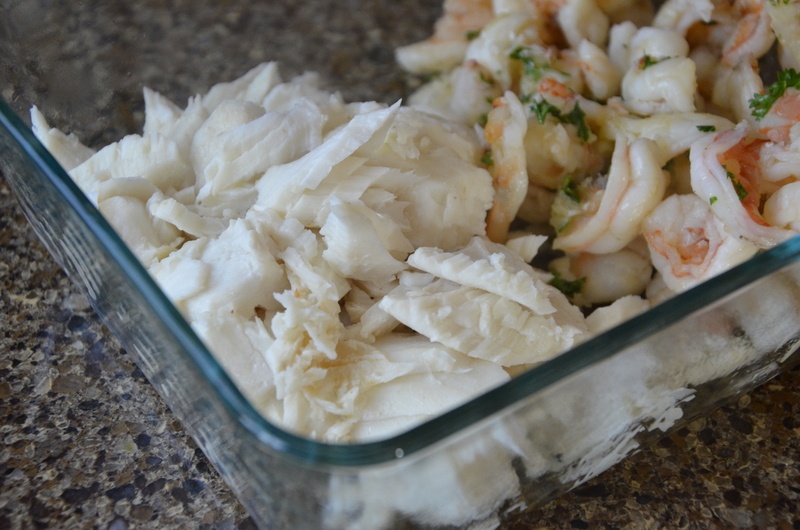 Add the shrimp to one and the halibut to the other. 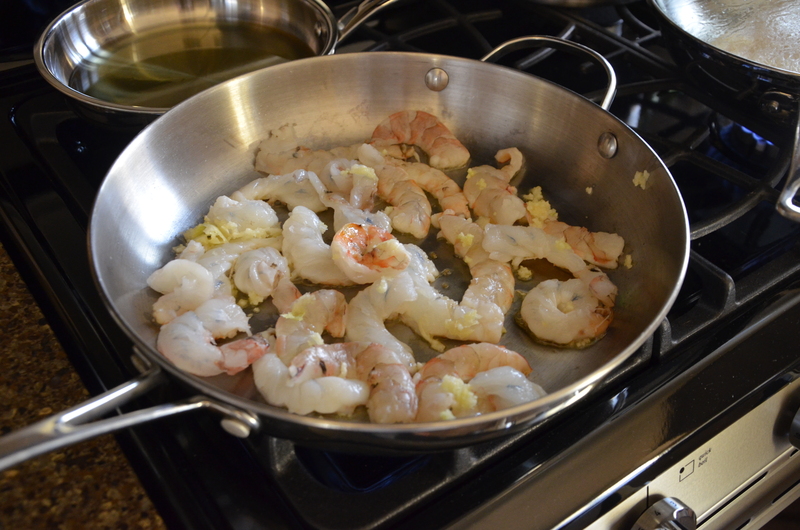 Add the pressed garlic to the shrimp and a pinch or two of sea salt. Saute for just a few minutes until the shrimp curls and is pink. 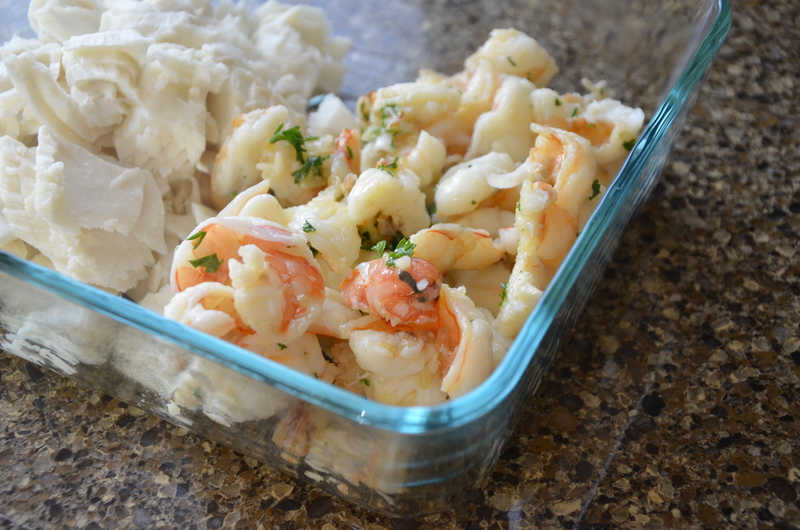 While the shrimp is sauteing, sprinkle garlic powder across the top of the halibut and add a pinch or two of sea salt. Add about 1/8 cup of water and cover, steaming for 10 minutes. 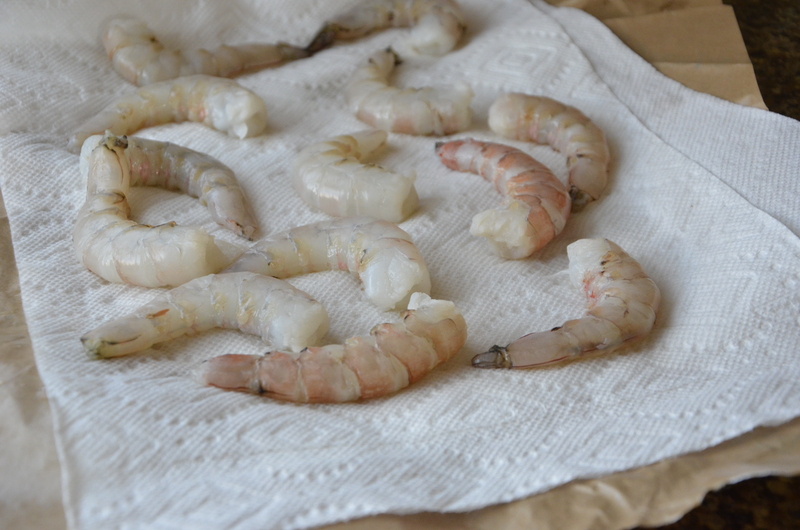 If you’re using very large shrimp, slice them down the middle as if you were butterflying them but all the way through. After sauteing, cut them again, but in half.